Though it was raining this morning, I went out touring, which I promised to do with my friends a few weeks ago. I was going to start at 9 o'clock, but it was raining at that time and I delayed the time after seeing the weather. Finally we started at 10:30 and the rain stopped around noon. At the beach side park in Futami town with two other scooters. After 30 minutes' riding it stopped raining. The nearest scooter is mine. We started for Uchiko town after 20 minutes' break. We turned left from the national road onto a narrow municipal road. The road was paved but narrow and tightly winding. I rode my scooter slowly because I was a beginner on the scooter. TTR (the name of my former off-road motorcycle) was excellent on such a winding road but my new scooter is not so good. Maybe it's because the turning radius of my scooter is wider than TTR. Anyway we passed the highest point and the border of the town. The greens around the road were very beautiful with the dew of the rain. 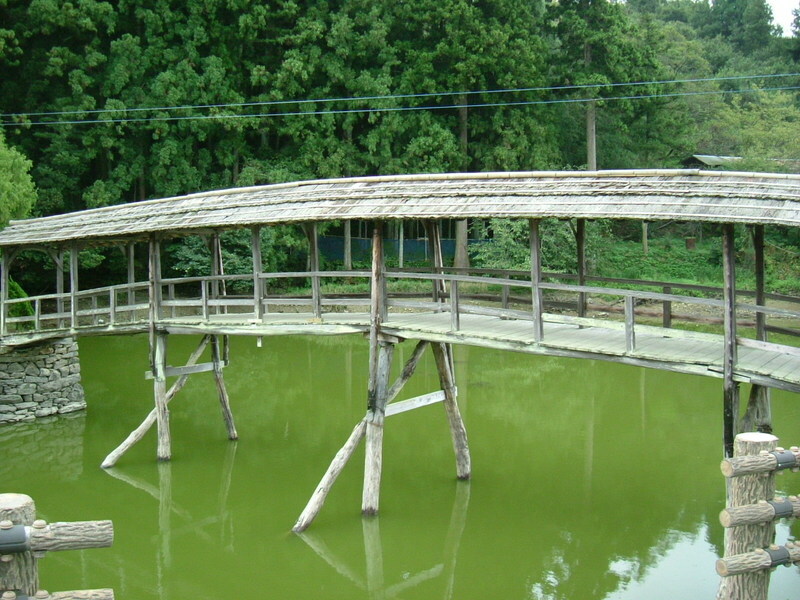 The picture shows a covered bridge that we encountered. It's just like the bridge in Madison County though there was no lady around here. We went on and on without checking the map. At every bifurcation we decided the way we went according to the mood of the moment. We came across another covered bridge that is shown in this picture. 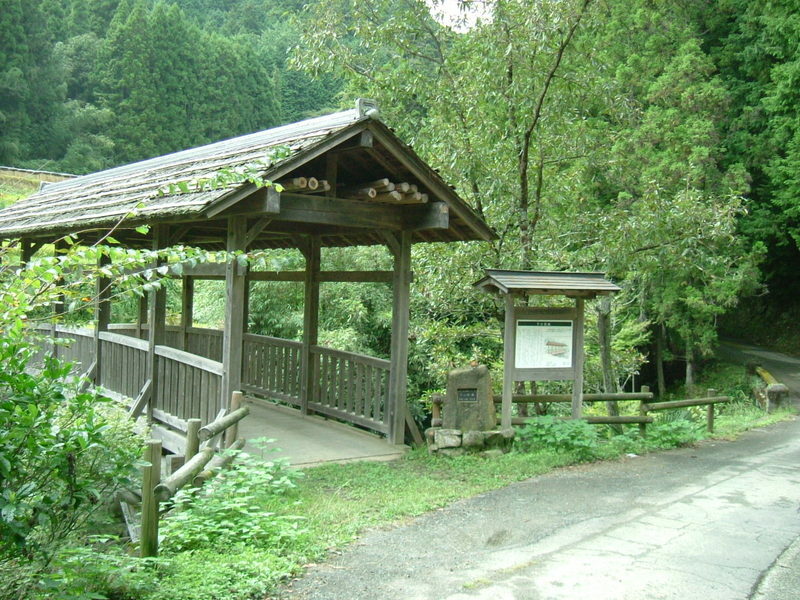 An old and mossy shrine stands over the bridge and people can visit there by walking on this bridge. 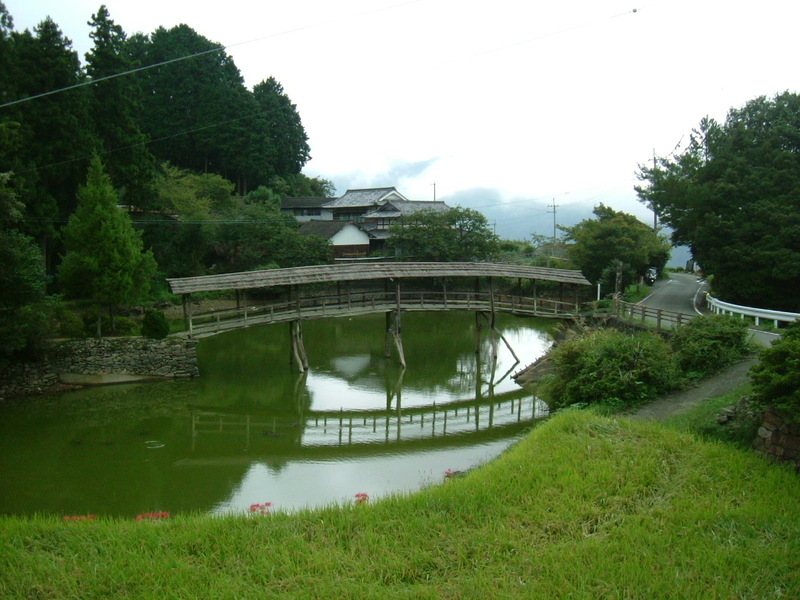 The next picture is a distant view of this bridge. The frame of the bridge looked so fragile. A friend who is an engineer said to me, "The arched structure of the bridge must hold the bridge." I really think so. 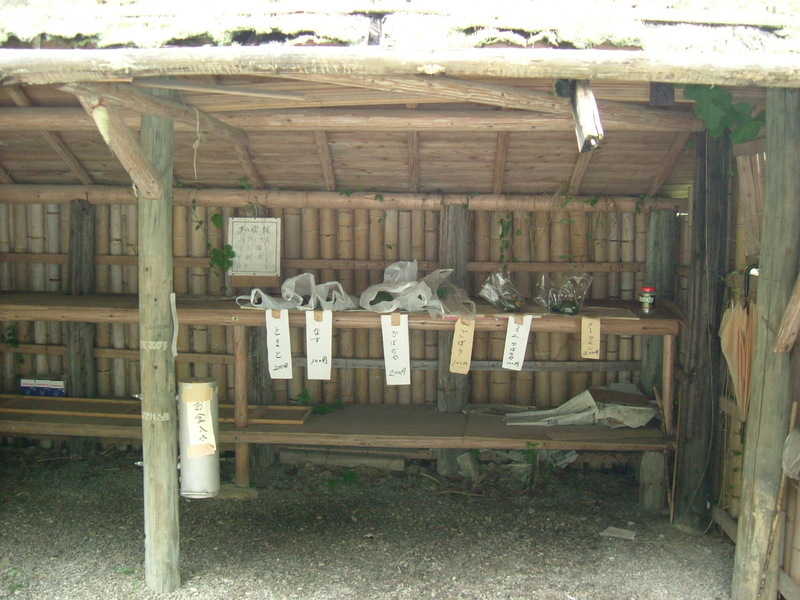 A street vendor hut. There's no one around here. If you want something here, you have to put coins in the can hanging on the pole. All the goods were harvested this morning and put here by farmers, so they are fresh. Moreover, the cost of the transportation is nothing so it comes at a lower price. 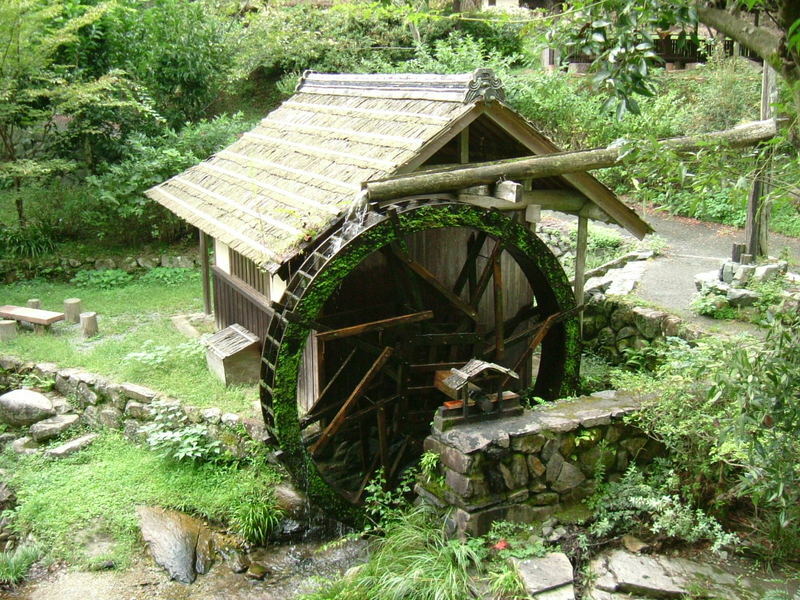 It's a watermill that we ran into. We enjoyed walking around the mill. This area was very intersting. The road was like a spider's web. The riding itself was fun. I thought I would be back before you know it. I knew about the city library but I've never been there because I didn't expect much from it. In addition, I have to pay a parking fee if I go there by car. In other words, the city library wasn't necessary for me. I have a scooter now. This scooter is very convenient to carry things. I dropped in at the city library and was surprised to see their system. To my surprise, you can search books via internet from your house and also can rent them out not only at the central library but any branch which you chose. It's just like the library in Vancouver which is written about in the above blog. I think I will sometimes drop in at the library on the way back home from now on. I have been learning Korean for two years from TV or radio program on the NHK educational channel. I knew many things about the Korean culture on the program and got interested in them. One of them is Korean dishes. I happened to know about a cooking class of Korean dishes the other day and the dish that would be cooked in the class was samgetang. I immediately signed up for the course. 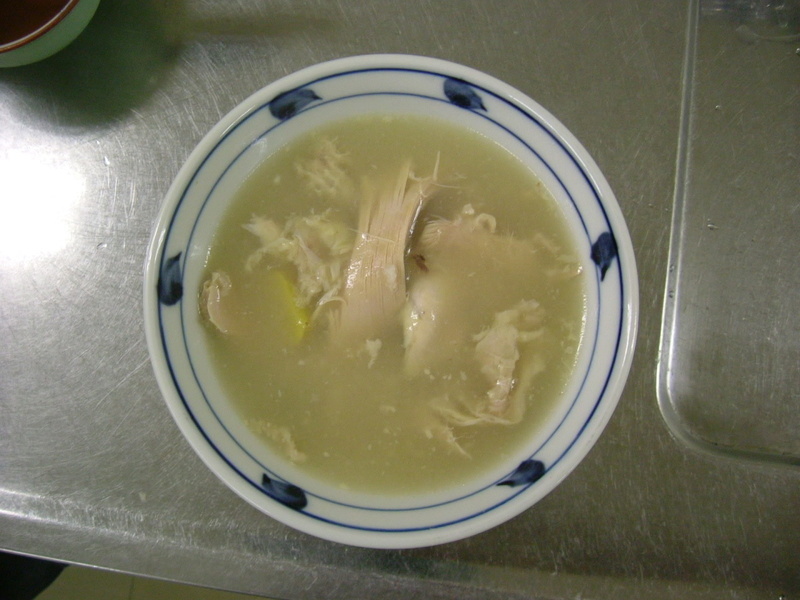 I was expecting that I could cook samgetang by myself, but I couldn't because it takes more than four hours only to boil it and we didn't have enough time in the class. The instructor prepared the dish previously on our behalf, and we had only to boil it for an hour. I learned how to prepare the food while boiling it. The instructor was an elderly Korean lady who owns two restaurants. She was Korean but was not good at using Korean because she was born and grew up in Japan. However, she looked happy when I told her things about South Korea. 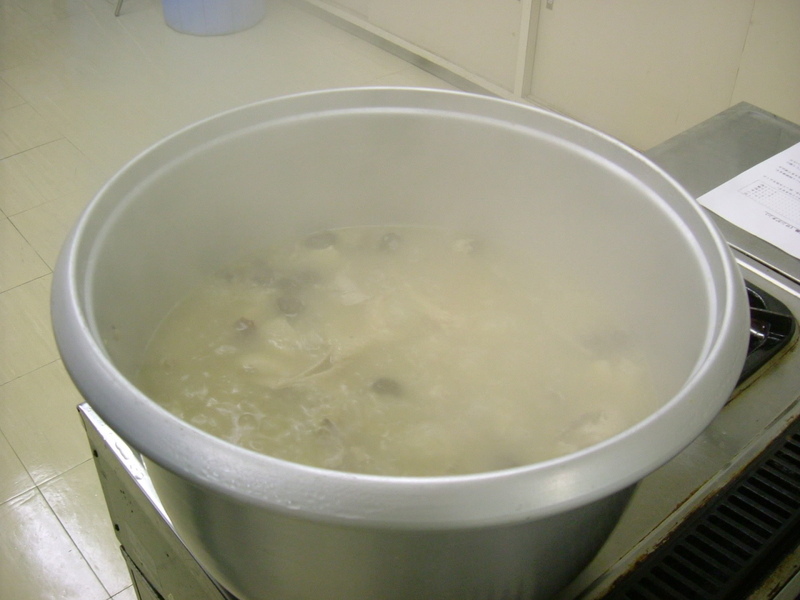 Pictures show the boiling pot and served samgetang. It doesn't look so delicious, but the taste was very good. Anyway, I enjoyed not the cooking class but the eating class! Many Japanese people got intersted in the Korean culture and watch Korean TV dramas and movies now. Many artists of both countries visit each other. She repeatedly and happily said that she couln't imagine today's boom in Korean culture in Japan when she was a child. She seemed to have been living in Japan trying to avoid Japanese society. There's a Korean primary and junior high school near my high school. I used to belong to the soccer club in my high school and I knew the level of Korean soccer was relatively high. I wanted to play a friendly match with them, but I couldn't. I felt a kind of unvisible barrier between us and them. The direct distance between both schools was only 200 meters but there was no exchange of students. I didn't know why that happened in those days. See also here. I feel learning languages, including Japanese, makes me open-minded. I don't know when the next class will be held, but I'll try the next dish. I found two articles in the International Herald Tribune this morning. I was deeply disappointed to read one and was buoyed up by the next day's article. Pope Benedict held hands with the devil. He confirmed that the bishop, who had been installed as Bishop of Beijing by China's state-controlled Catholic Church, was the official bishop of the Roman Catholic Church. What a terrible pact made between the Vatican and China? On the other hand the German Prime Minister, Angela Merkel, invited the Dalai Lama as the nation's guest. In addition she strongly accused Wen Jiabao (温家宝) of a Chinese hacking attack on Germany and the U.S. when she visited China a few months ago. Her attitude is consistent and great and Japanese politicians should model themselves after her. This is both troubling and sobering news. I'm totally in favor of her policy. His visit is embraced favorably by mainstream German media. Today is the Autumnal Equinox Day and my birthday. This day is a national holiday in Japan. Some of my friends and my daughters gave me gifts. Besides, this year I got a new scooter. The last year in my 40s has just started. Some people say that I always look happy and vigorous. I don't know why, but it might be right. I really think I'm a lucky man to know nice people in my life. My second and youngest daughters have been getting their teeth treated because of crowding of the teeth for two years. My youngest daughter looked happy this morning. She was going to see her dentist and have the appliance removed. I was relieved to see her corrected teeth. Talking of teeth, when I was a medical student about 30 years ago, my clinical instructor asked us, "How and who do you choose among some unconscious people who were equally seriously injured and transferred into your hospital at the same time?" The answer was, "You can figure out his or her lifestyle from their teeth. The condition of the teeth highly correlates with their daily life or their social status. The distinction is of course not good, however you would often have to make prompt decisions about many difficult problems." It was a tough question. This might be one of the reasons that I recommended my daughters to get the orthodontics. My new scooter arrived. I bought a motorcycle for the first time in 11 years. The development of the technology in this field is also unbelievably wonderful. First of all, this scooter has no keys for starting the engine. The rider has only to bring a small box with him to control this scooter. When he has this box in his pocket, he can use all the functions of the scooter. It seems extremely difficult to start its engine without this control box and this prevents a robbery. It's impossible to work all the functions by destroying the key cylinder and connecting the lines directly because this scooter has no key cylinder. When a man who has this controller comes close, the scooter automatically cancels the immobilizer. On the other hand, when he is away the scooter sets the alarm by itself. It's very safe and convenient. This scooter also has a big storage space under the seat. It's about 60 litres. Besides, I ordered the extra space that you can see in the picture. That's the black box. 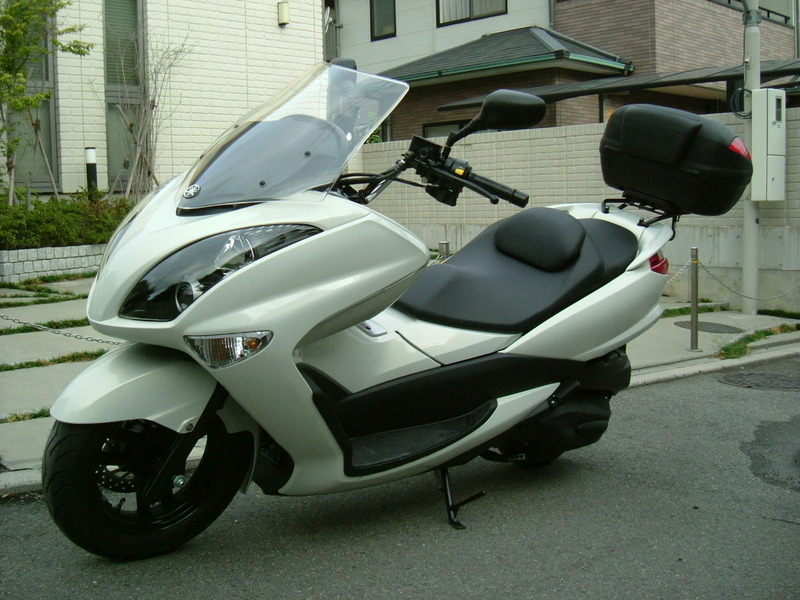 Though I wanted to change its color to white, it would have cost 13000 yen (100 U.S.D.) and I gave up. 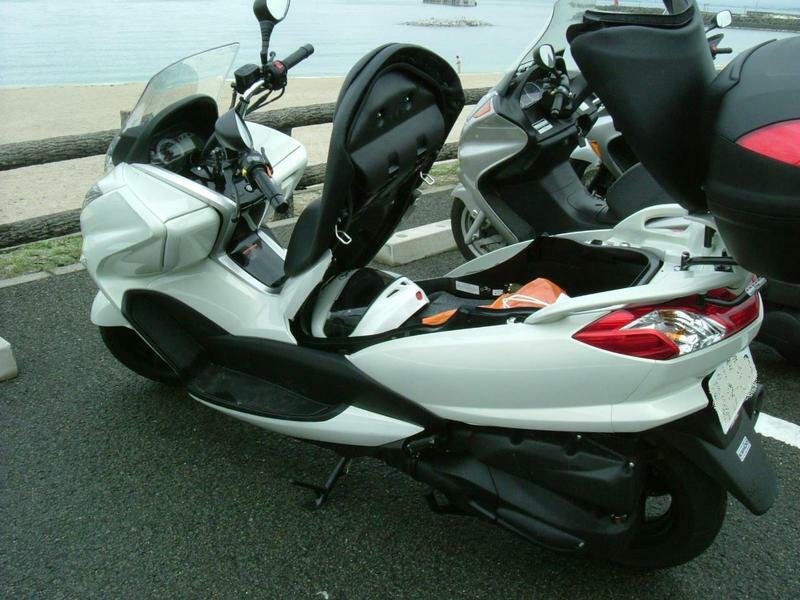 However, I might change it some day because black doesn't look nice for this white scooter and I don't like it. The pictures show my new helmet. 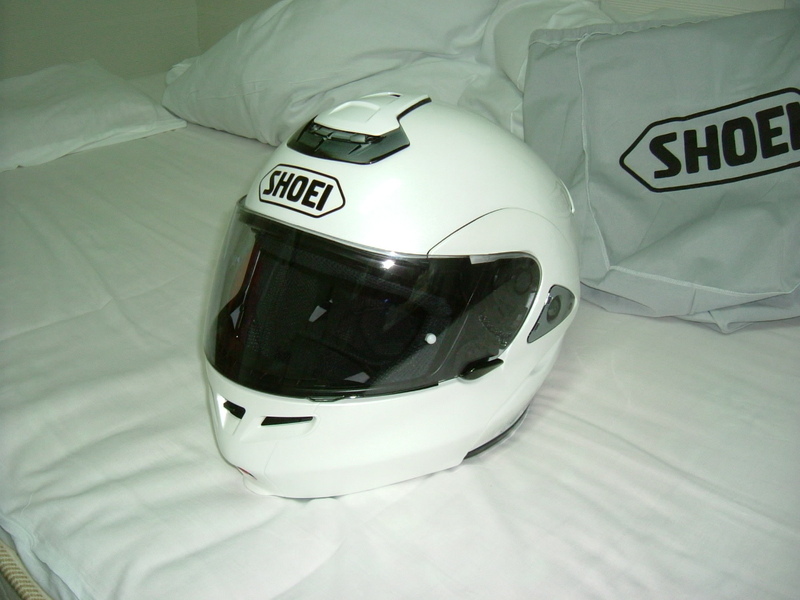 I chose a white scooter, so I made my helmet white. This helmet is a full-face type but I can raise the chin part up like in the picture. It seems to be the latest technique. Besides, the air ventilation system is wonderful. 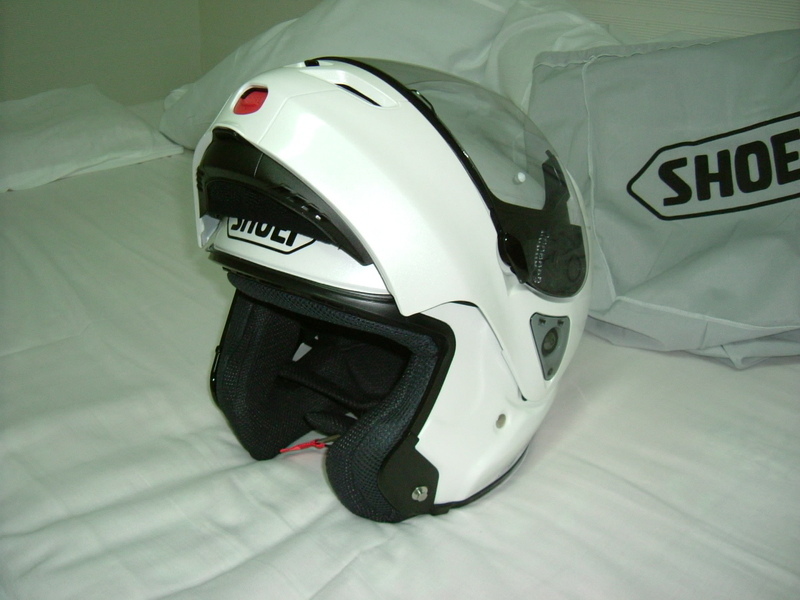 The helmet has some opening for intake and outlet of the air. I'm looking forward to riding my new scooter with this helmet on. My new scooter is supposed to come tomorrow. I'll take some pictures and show you here. 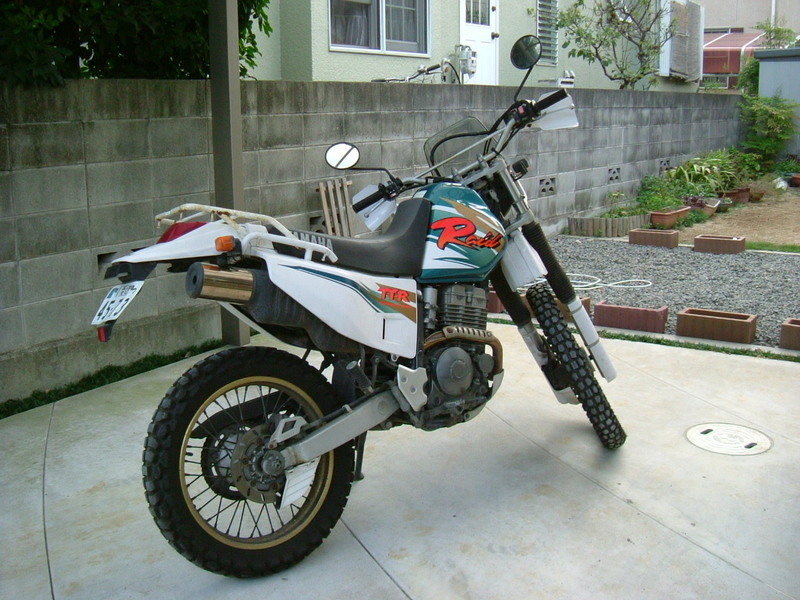 I sold my off-road motorcycle (TTR 250 Raid). I felt deep gratitude and a great loss. This motorcycle didn't have any problems for 11 years. 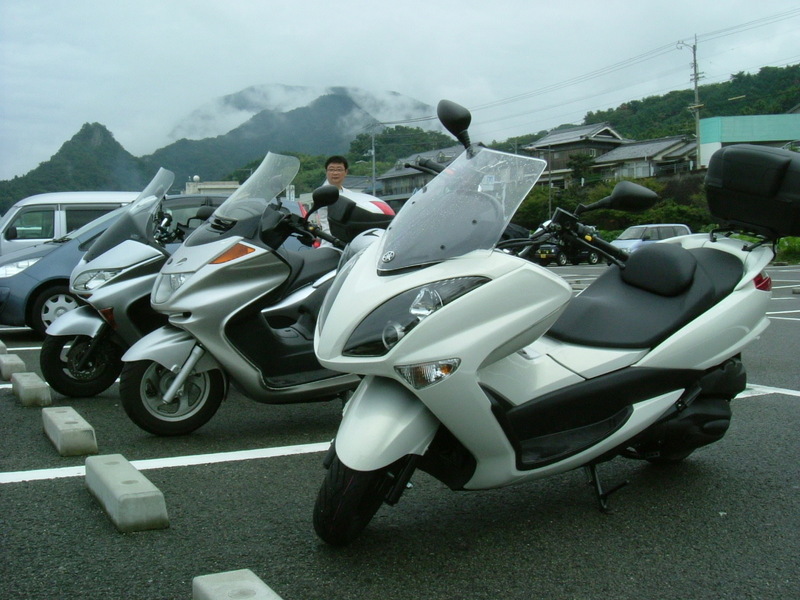 I enjoyed riding in Hokkaido three times. When I was working in a small clinic in a rural village, I did house visits with this motorcycle regularly because some of the roads in the village were narrow and made of dirt. I firmly gave up riding on the forest roads and I made up my mind to buy a scooter, which is made for paved roads. Just before I took my motorcycle to the shop, I took some pictures of it in my garage. I read a shocking news item in the newspaper this morning. ANA regular flights between Matsuyama and Sapporo will be discontinued next March. As I wrote in August, my youngest daughter is eager to enter Hokkaido University in Sapporo City and I allowed her to do so. It's because Sapporo is not so far from here by airplane. When there's no direct flight, however, I have to change planes at least once in Tokyo or Osaka. I'm afraid It will take 3 more hours to reach Sapporo. I decided to buy a new motorcycle. I have a motorcycle for off-road riding, but this is 11 years old and not convenient for daily use. I dropped in at a shop near my house, where I usually go for maintenance of my motorcycle. The shop owner said that my motorcycle was kept in good condition and still popular among middle aged people, so I could sell it for a good price. 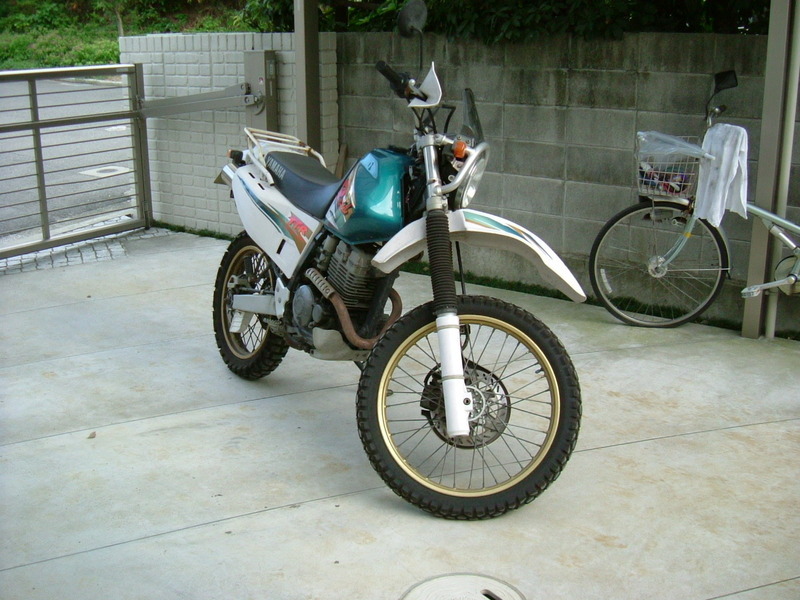 With 450,000 yen I bought it 11 years ago and he wanted to buy my motorcycle for 100,000 yen. It was a really good deal. 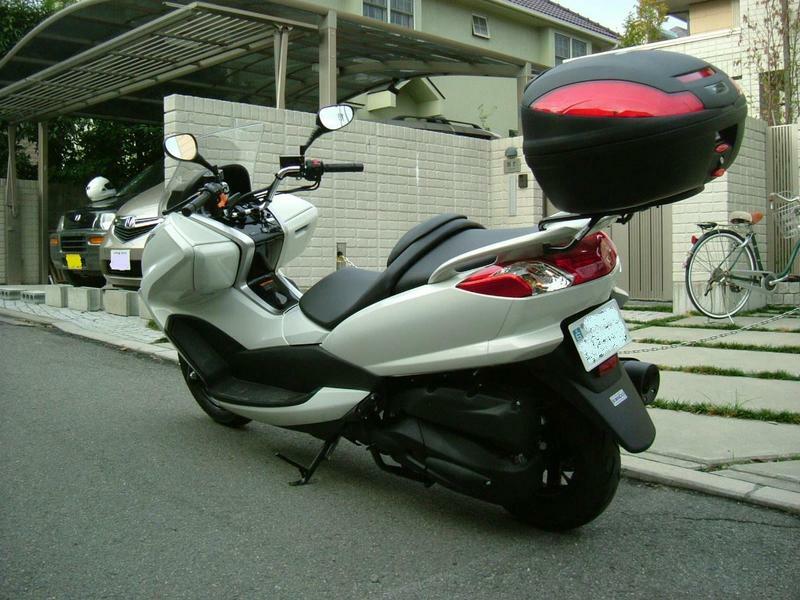 By the way, how can I persuade my wife that I need a new motorcycle? That's a big problem. A sad story came along. China seems to be building a new airport again at the border of North Korea, near 長白山 (Changbai Shan). The Chinese authorities say that the airport is for sight-seeing and would be connected to Beijing, Tsingtao, Dalian and Changchun at least until next summer. However from any angle the aim of the hasty construction would be for the diversion of the airport to military use in case of military tension. I'm afraid one of the most beautiful places in China could be polluted. 長白山 (Changbai Shan) is called 白頭山 (Paektu-San or Baekdu Mountain) in North Korea. See also here. Let me explain this incident. The Pacific War is supposed to be over on Aug. 15th in 1945. In fact, unbelievably, all the fights were over by the voice of the Emperor in most battle fields. Japanese soldiers threw their guns away on this day. However it was not the case in Hokkaido and China. I write about the case in China here. In China the roundup of Japanese was still happening a half year from the end of the war. Genocide of more than 3000 Japanese was committed in Tong Hua City (通化市) on Feb. 3rd 1946 by Chinese communists. I hope this incident will be in the public eye. Chinese authorities insist that they fought Japan in the Pacific War, but it is not true. It was the Kuomintang Party that fought Japan. Chinese communists were just hiding in the mountain and they started to fight around the end of the war. Besides, it was the Chinese communists that organized massacres against Japanese after the war. Many Japanese who were waiting to go back to Japan were cruelly killed. I want all of you to investigate this incident. Let's have knowledge based on the true evidence. I go out for some house visits on Friday every two weeks. The patient that I visited today is an 80 year old gentleman. He is being cared for by his wife. It is not easy to believe this story, but he survived two kinds of serious malignant diseases in his 50s. After that, he has been suffering from rare diseases one after another. His wife says that it must be due to the atomic bomb in Hiroshima. He was a teenager when the bomb was dropped. Hiroshima is three hours away from our town by ship. He seems to have gone to Hiroshima with his teachers and schoolmates to rescue people the day after the bomb. His role was to recover numerous bodies out of the river and find things to show their ID. If he could find the name of the body, he carried them to some places for the people looking for their relatives, friends and acquaintances. If he couldn't, however, he carried them to the Body Dump Station. The bodies were thrown into the fire. He and his group were working in Hiroshima for a few days. They wanted to work more, but they didn't have enough food to continue their volunteer work. People at that time didn't have any knowledge about the radiation. They didn't mind being exposed to residual radiation. Many people got invisibly injured like this. This fact is not widely known to the public. Researchers and developers of the atomic bomb seemed to predict that no trees and grasses could grow in Hiroshima for the next 50 years. This prediction was fortunately wrong, but was it necessary to drop such a cruel bomb on Hiroshima? If the U.S. only wanted to stop the war, they should have dropped the bomb in the Tokyo Bay area. The Japanese authorities, including the Emperor, would directly have seen the mushroom cloud. One more thing, I'd like to ask Mr. Truman the reason why the U.S. chose Hisoshima and Nagasaki as victims of the atomic bomb; a wide city around which they could draw concentric circles in the horizontal area and a city that is closed by mountains on one side and open in the direction of the sea. Both geographic locations must have been attractive for the researchers of radiation. I make it a rule to watch one DVD movie a week. It's because I like movies, of course, and I have one more reason. Every DVD movie has subtitles of many languages. I usually watch movies in English with Japanese subtitles. If I come across some good or witty expressions, I watch the same scene again with English subtitles and I always try to memorize the lines as much as possible. I feel delighted to see the same expressions as I learned from books. The words that I found in the lines or in the pictures of movies are always imprinted clearly and surely on my mind. I think that watching movies might be one of the good methods to increase vocabulary. When there are many slang words or words that need background knowledge of American history, show business, current common affairs and a background as an American, it is extremely hard to understand the story. However, even in such a case, I have begun to be able to figure out the rough story. 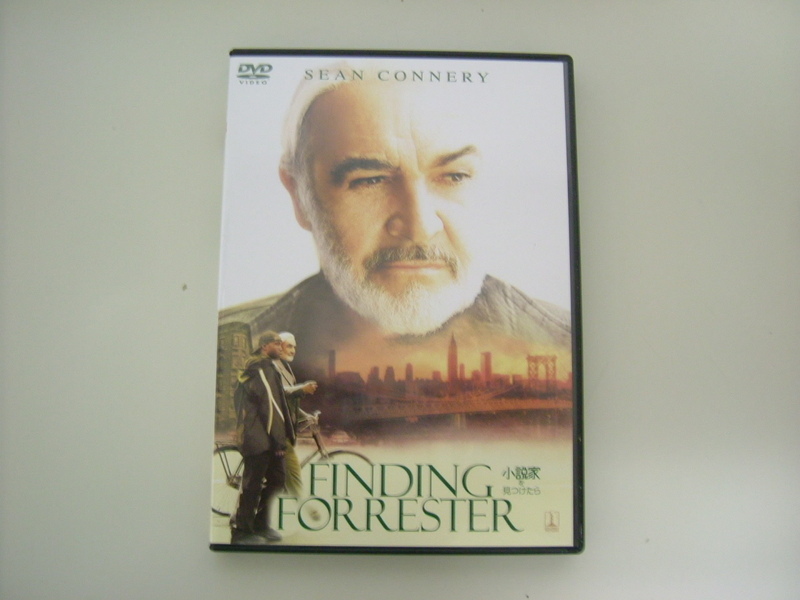 "Finding Forrester" is the title of the movie I watched today. At about 1 hour and 9 minutes from the beginning, I found the good thing. Most entries of this blog are getting corrected by a native speaker. He always advises me not to use "And", "But" and such conjunctions at the beginning of each sentence. I have wondered why? When I speak Japanese, I often use conjunctions at the beginning of the sentences. I wouldn't have found the answer to his remarks in my grammar book for a long time. Sean Connery is starring in this movie and discussing with his student about conjunctions at the beginning of sentences. It was just the answer I wanted to hear. He is acting the role of a famous novelist, the professional writer in the movie. He said that the sentences will give a run-on feeling if you use conjunctions at the beginning of sentences. By the way, why do you think I reacted to this scene? It's because it's the second time I've met this word "run-on". A Korean-American? was using the word "run-on" in the following blog. I'm deeply honored to be written to as above. Anyway, I felt I fully understood the meaning of "run-on" this time. When I started to learn English, the purpose of it was only to enter university. In the entrance examinations we were required to translate Japanese sentences into English, but the question was only one or two sentences. You know, we didn't practice writing essays or long stories. I figured out why I didn't mind using conjunctions at the beginning of each sentence. This movie was greatly profitable to me. Do you know what the absolute best moment is? It's when you've finished your first draft and you yourself read it. It's just my feeling at this time. Japan is one of the developed countries now, but in terms of smoking it is not keeping up. It is true that the total smoking rates in Japan are decreasing however the number of young female smokers is increasing rapidly, while the rate of adult male smokers is decreasing. To my sadness, the incidence of smoking among my staff members surpasses 70%, especially with nurses and care workers. We are working in the field of medical services. I couldn't believe this fugure at first. Smoking apparently harms not only the person who smokes but the people around the smoking person. I proposed a total ban on smoking at all times in my hospital at the monthly conference. The members who don't smoke were fully behind my proposal, but the other looked like they were against it. However, such smoking people do know that smoking is harmful. I asked them why they didn't refrain from smoking in the office. I continued that we were working for sick people IN THE HOSPITAL. They couldn't help agreeing to my proposal. I don't smoke and I'm one of the ranking members. All doctors, including part time doctors, are non-smokers. I hope smoking members don't think I am grilling them and my proposal is a power harassment. My eldest daughter, Eri, came back home for the first time in four months. She lives in Tokyo and she is on summer vacation now. I hope that she cleans the whole house up and teaches some subjects to our youngest daughter, Annlie, because she has no job and has nothing to do here. Her stories were fresh to me. Her major is quite different from mine, so her story was sometimes beyond me, but I was happy to even hear such stories and to know that she was going beyond me. We had dinner with the whole family today. Annlie seemed to have so many things to talk over with her two sisters. She is usually a single daughter, but tonight was her night and it's such a noisy night. I don't know when they are going to go to bed.